CARFAX 1-Owner. FUEL EFFICIENT 41 MPG Hwy/43 MPG City!, $500 below NADA Retail! S trim. iPod/MP3 Input, CD Player, Onboard Communications System, Alloy Wheels, Back-Up Camera, Hybrid. AND MORE! 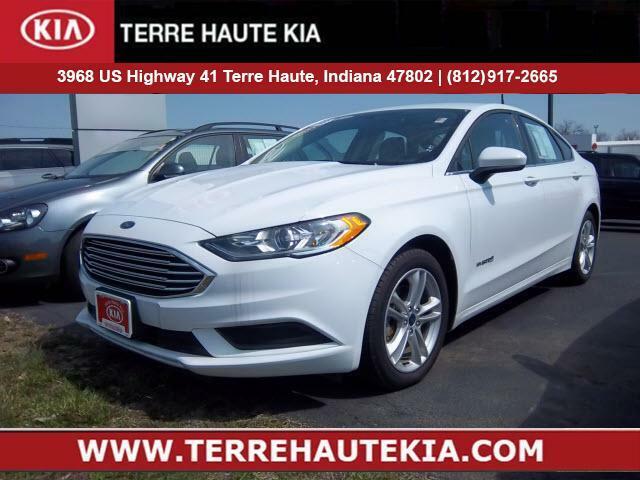 Back-Up Camera, Hybrid, iPod/MP3 Input, CD Player, Onboard Communications System Ford S with Oxford White exterior and Medium Light Stone interior features a 4 Cylinder Engine with 188 HP at 6000 RPM*. TheCarConnection.com's review says Brake blending is excellent; Ford and Toyota have the most experience in combining regenerative and friction braking of any hybrid makers, and it shows in largely seamless transitions.. This Fusion Hybrid is priced $500 below NADA Retail.